After the Chicago Blackhawks 6-2 win over Winnipeg, debut goalie Scott Foster was named 1st star. Despite only playing 14 minutes, Foster saved all seven shots he faced. While this might be his only NHL appearance, Foster has shown everyone you never give up. 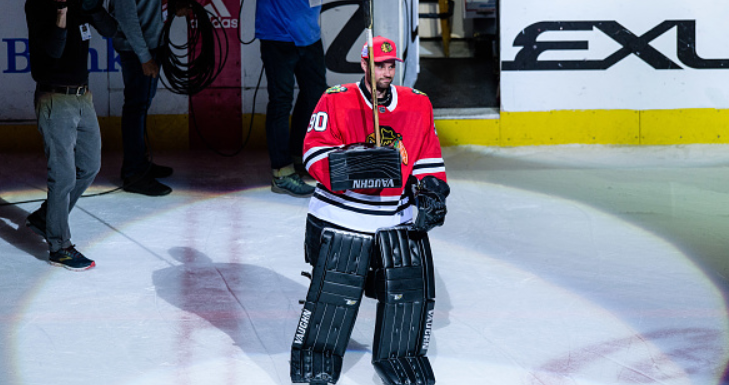 Chicago is currently facing a severe goalie crisis. Corey Crawford and Anton Forsberg are out through injury. Foster was signed to as an emergency backup. Before this game, the 36-year-old had played college hockey for WMU from 2002-2006. Before this game, he had been working an accountant. When starter Collin Delia went out, Foster was forced into action. He now holds a rare distinction of having a 1.000 save record. However, Foster is not the only old player to make his debut late, let’s look at some other late bloomers who grabbed our attention. Back in 2014, goalie Rob Zepp made headlines after his debut for the Philadelphia Flyers. At 32-years-old, Zepp had waited a long time to make the NHL. Drafted by Atlanta in 1999 and then Carolina in 2001, the Ontario native had first played in the ECHL before making his way to Finland and then Germany where he forged a solid reputation. Zepp emerged as the winning goalie in his first game and played 10 times before retiring the same year. The Swedish D-man was 34 went he made his debut for Chicago back in 2007. Before he had a stellar career in his native land playing for both Västra Frölunda HC and Linköpings HC (being captain of the latter). Impressively, after two scoreless seasons for both Hawks and Florida Panthers, Johansson returned to Sweden via a one-year KHL stint. He would play a further five seasons for Linköpings before retiring in 2014. Making his debut for the Minnesota North Stars in 1972- 34-year-old Bob Barlow made an immediate impact. After only six seconds of his first shift, he scored past Flyers legend Bernie Parent. Barlow had previously had a solid career playing in both the AHL and WHL. It was his impressive performances for then WHL side Vancouver Canucks that caught Minnesota’s attention. Barlow went on to play 77 times and score 33 points before finishing out his career in the minors. The Latvian winger was 37 when he played his first game for Minnesota in 1989. Part of the Soviet who lost the ‘Miracle on Ice’, Baldaris primarily played for Dinamo Riga and CSKA Moscow. In fact, he had retired from hockey in 1985 and was coaching in Japan. However, when the Soviets were allowed to play in the NHL, Balderis returned to the game. Playing 26 times and scoring three goals, Balderis left Minnesota in 1990. He would finish his lengthy career playing back in his native Latvia. Also 37 years young at the time of his debut. Anderson is both an AHL and Springfield Hockey Hall of Famer. A career AHL player, Anderson was the all-time leader in games played (943) and scored over 426 goals and 821 points. It wasn’t until 1967 that Anderson was finally given a chance by the LA Kings. Playing in seven games, Anderson had a goal and two assists. In 1974, he became the first-ever coach of the Washington Capitals but was fired after one season. He spent the next 19 years as a scout for the LA Kings. Anderson sadly passed away in 2013 but remains a beloved figure in Springfield, Illinois. The oldest rookie on our list, Madigan was 38-years-old when he made his long overdue debut for St Louis in 1972. Previously, he was a consistent star for WHL side Portland Buckeroos. St Louis was suffering from an injury crisis and decided to give Madigan a shot. Overall, he played 20 regular season games and five playoff games, notching up three assists. Having finally been given a taste of the big time, Madigan finished up back in the minors for San Diego Gulls and once again, Portland. So, if anyone out there is still considering pro hockey, its never too late!